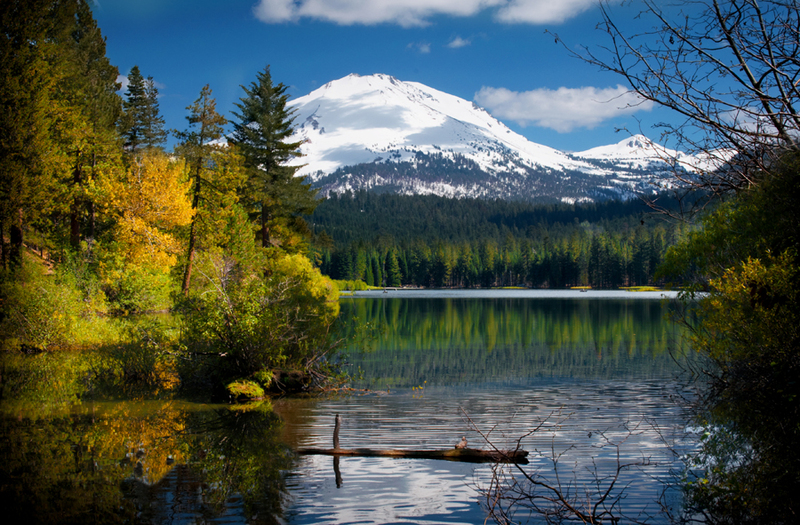 Manzanita Lake is a favorite of locals for so many reasons. It’s a short 45 minute drive from Redding. The temperature is cooler in the summer making it a great place for a hike or a picnic. And, usually I see someone fishing. Capturing Mt. Lassen at its best is difficult. Previously when I’ve tried to photograph Lassen it’s either too snowy and the roads are closed or not enough snow to show off the peak or covered in clouds. This year Mt. Lassen had an extra abundance of spring snowfall giving this mountain a full fluffy coat, even as late as July. Perfect! From Redding I could see that it was a clear day at Lassen and the peak was just sparkly. I called my dear friend to see if she wanted to go with me up to the lake. She said “Sure…do you mind if I bring the twins?” Off we went with her two and my two on a mad dash to capture this image. It was worth it. We were welcomed with an awesome view. My intention in capturing this image is to show the beauty of Mt. Lassen reflected in the lake. Looking at the image I want the viewer to feel the intenseness of standing at the foot of a volcano while at the same time seeing its serenity. I often wonder how God, our Creator, could dream up such fantastic explosive landscapes that mellow over time into these gorgeous scenes. The best word to describe this is awesome.